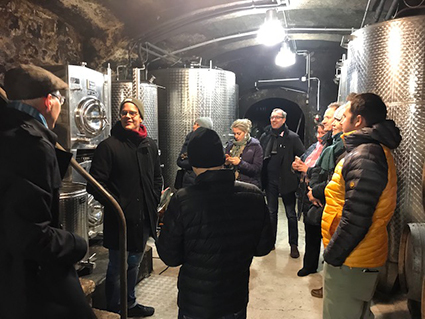 Last week in the exquisite village of Rust in Burgenland in Austria, I was treated to one of those very rare tastings of your life, of magnificent wines from the cellar of Heidi Schröck. Rust - actually a historic city-state rather than a village - is the venue for one of the Student Seminars run by the Institute of Masters of Wine, and I am very happy to take part. One of the evenings we break into groups and each visit one of the local producers, and I think it is fair to say that getting to visit Heidi is a bit like winning the Golden Ticket. With her son Georg - the next generation of winemaker - and featuring some wines from her cousin as well, we were treated to a visit to the underground cellars which date from the 16th century. A wooden partition is still extant from those days, when the cellar was a venue for parties and it was necessary to keep the great wine safely out of harm's way. The house above was built between the 17th and 18th Centuries, and once served as home for many families, in rather cramped conditions - the tasting room, which barely accommodated ten of us around its table, was once home to a family of six. Nowadays, and somewhat larger than originally, it is Heidi's family home, and a very welcoming one at that. The Schröcks own 8ha of vineyard land around the village, and farm a further two more. But, especially in the light of the tiny yields of grapes the vines produce for sweet wines at this quality level, the production is minuscule. 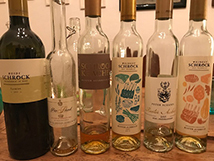 The wines are celebrated and highly sought-after, and accordingly Heidi and Georg have no need to switch production or planting towards drier style wines, but remain arguably the best exponent of the traditional Ruster Ausbruch sweet wines (-er is the German suffix equivalent to 's in English. Wine students are often taught that Ausbruch is a sweetness level between the German Beerenauslese and Trockenbeerenauslese (usually closer to the latter), but in fact the Austrian adoption of the German classification system (in itself based on ripeness of grapes at harvest rather than sweetness of the resulting wine) came far later. When the Austro-Hungarian empire was at its height Ruster-Ausbruch was to the west of the Empire what Tokaji was to its East. And with good reason - as the resulting wines are similar in style and equal in quality, often even better. Producers in Rust may, and sometimes do, still use the terms 'Spätlese' and 'Auslese' for lighter sweet wines, but for their truly elixir-like dessert wines, Ruster Ausbruch is their very own traditional badge of quality, and they are - quite rightly - keeping and celebrating that. Climate change is affecting the region as it is so many others. In the 1980s the harvest never started before October 10th (and was 50% sweet). Now it sometimes commences in August (and only 10-40% sweet). It is essential to net the vines against birds towards the end of the growing season, and the adjacent lake - Neusiedlersee - a large body of shallow water, is a significant part of the microclimate. Often in winter it freezes (although increasingly rarely) and sometimes in summer it lowers, or even dries out completely. This happened once in the 19th century for a whole decade, and during that time no sweet wines were made at all. Somewhat scarily it also heralded the arrival of the Siberian Tarantula, an eight-eyed confection of nightmares if ever there was one. 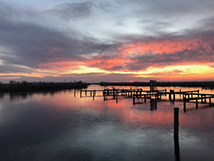 Neusiedlersee has been likened to an amphitheatre - the stage is the lake, and the best seats are for the noble botrytis vineyards which overlooks it. This evening they also showed us a couple of wines from their cousins, named Schandl, including a very rare older treat to finish. 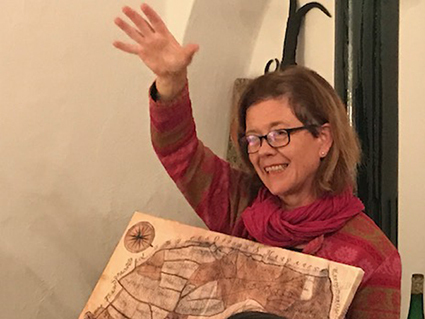 Fortunately, while needing spittoons for professional reasons (sometimes anyway), Heidi is the very embodiment of someone who makes good wine, and like many of the world's best winemakers is also a charming person, eager and happy to spread her knowledge and love of her wine and the history behind it. A trait she has also evidently passed on to Georg. Schandl are cousins of the Schröck family. Single vineyard Furmint and Sauvignon Blanc. Early bud-break, wet summer and final botrytis. What a superb way to end an amazing one-off tasting. 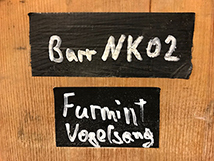 If you are ever in Rust, I cannot promise you will get to taste wines like this, but I feel sure you will be accorded just as warm a welcome from these charming people.